Living beside the water has always acted as a magnet – particularly for those who can afford to pay the premium for having a view out onto the river. For most of the last century, there was a steady growth in the number of permanent houses erected along the banks of the Thames – and also on many of the islands that dot the river’s course as it runs through Surrey and Middlesex and on into London. I’ve written before about the lovely homes on Pharoah’s Island in Shepperton and the houseboats that surround Taggs Island in Molesey but just a little further downstream, past the splendour of Hampton Court Palace, lies another island which sports many homes – Thames Ditton Island. The island was originally part of the lands of the Manor of Imworth (which later became known as Imber) and was known as Colly’s Ait. It was simply described as ‘two acres of pasture’. During the latter part of the 19th century and the early part of the 20th, day trippers from Kingston would often moor their rowing boats by the island to enjoy a picnic and a glass of wine and it was from that point on that some recognised the attraction of having a riverside pied a terre from which to enjoy the pleasures of the Thames. Wooden weekend huts and chalets began to appear and eventually the idea spread and a number of holiday chalets were built on the Island, covering the entire perimeter by the 1930s. 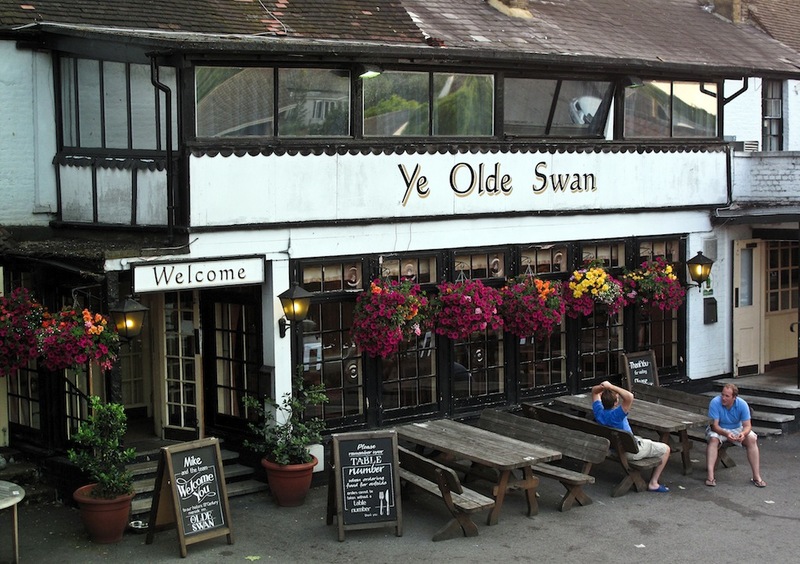 However, it was the building of the suspension bridge between the slipway next to the Olde Swan Inn and the island that really saw a residential revolution. The bridge brought in vital services like water, gas and electricity and also afforded a method of piping away the sewage and waste from the island’s inhabitants to the main sewerage system on the bank. Weekend holiday homes suddenly became permanent residences. From 1963 the 47 houses and bungalows on the island were all freehold and the householders got together to form a limited company that took on the responsibility for maintaining the island and its vital bridge link. 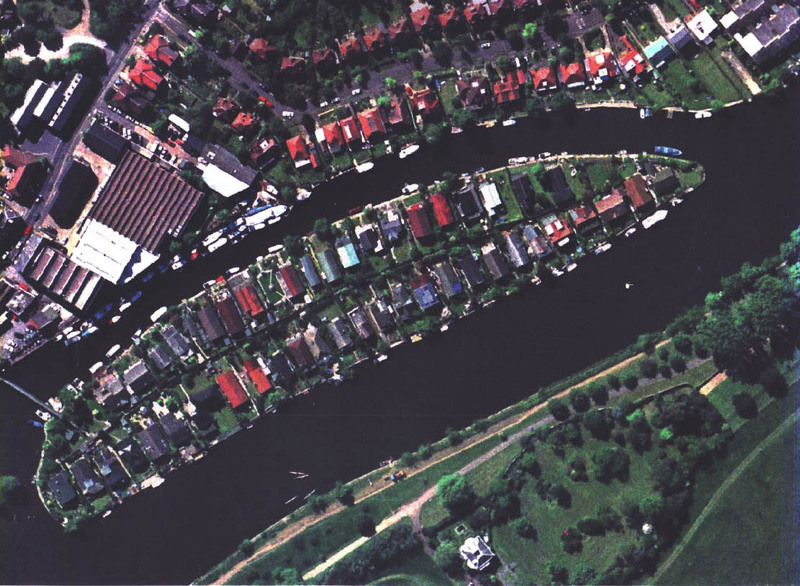 There are two much smaller islands adjacent to Thames Ditton Island – Boyle Farm Island (which has just one dwelling on it) and Swan Island, currently uninhabited, which used to house a ferryman’s hut for those wishing to travel between the Middlesex and Surrey banks of the river. Is there a downside to riverside living? Well, if the doom merchants are to be believed, global warming may well result in significant rises in mean sea level with all the implications that has for those who live just a few feet about the water level. That, and, I suppose, the problem of feeling that you are living in a goldfish bowl as those aboard cabin cruisers and passenger boats alike peer in through your sitting room windows! Nevertheless, I think I could probably live with that.